Tony Washington (Thor) foils a robbery at a local grocery store only to be run over and killed by a group of savage suburban teens. But the horror has only just begun, for in the darkest recesses of Tony's backyard, a voodoo ceremony takes place which resurrects Tony into a superhuman zombie avenger. One by one, Tony's ruthless killers are graphically and brutally murdered as the undead Tony takes his gory revenge! The stage is set for a bone-chilling climax as the authorities (Adam West and Frank Dietz) finally come face to face with the dead rising from the grave. 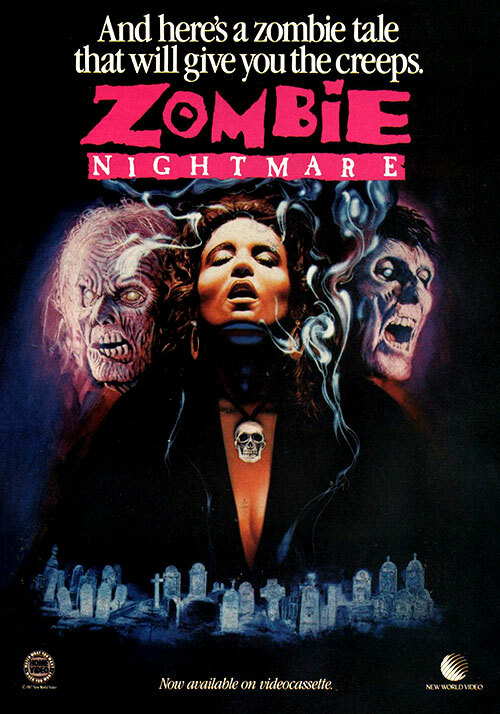 Featuring ACE OF SPADES by LEMMY AND MOTORHEAD on the soundtrack, as well as PANTERA and GIRLSCHOOL, ZOMBIE NIGHTMARE is a heavy metal trip of zombie horror vengeance! 1 Response to "Zombie Nightmare (1987) Jack Bravman"